A fully-loaded, expedition-ready 12′ toboggan! [Looking for the details on our industry leading 3- & 7-year toboggan warranties? Jump to the bottom of the page. Have your toboggan already and looking for tanks or top bags? Our Toboggan Outfitting Guide is coming soon!]. 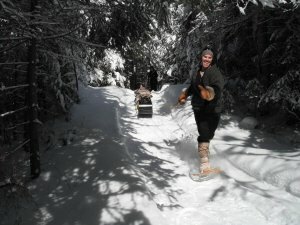 The long, narrow flexible design of a traditional toboggan allows it to follow your snowshoe track gracefully in the deepest of mid-winter powder, and flow over blow-down on the roughest portage trails. Traditionally made of hardwood planks (Tamarack in the north), we now make ours from a couple of different grades of low-maintenance, low-friction Polyethylene, in three different lengths. One way to haul a bigger load: link two shorter toboggans in tandem (riding optional). 8′ Toboggans are incredibly maneuverable. 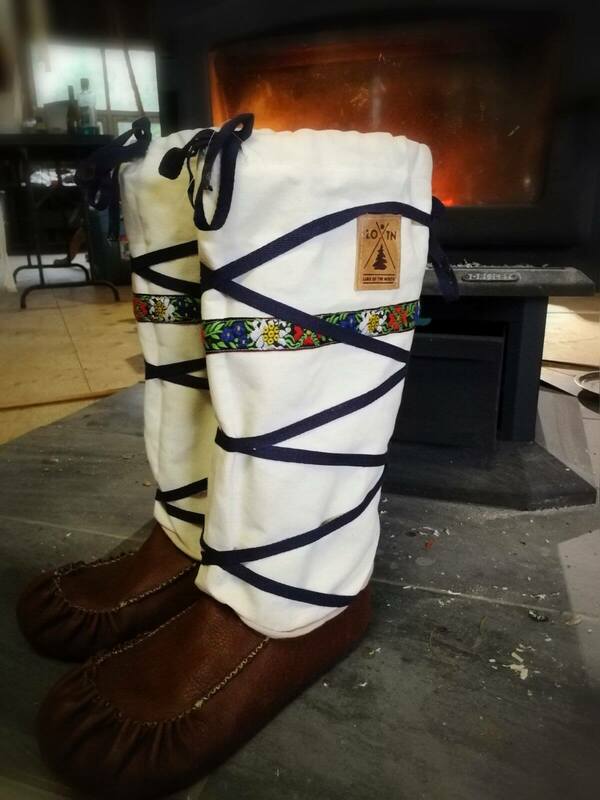 They will pivot on a dime and are easily (wo-)man-handled through tough portage trails. A couple of people traveling together on a week-long trip could easily split their load among two 8’ers if they packed carefully. If you’re traveling solo with no one to share the load, you might find an 8′ toboggan limiting in its capacity. 10′ Toboggans are the workhorse of our personal fleet. Still fairly easy to handle and maneuver on portage trails, they can pack a significant load for extended trips, solo travel or just bringing along extra creature comforts. We outfit nearly all trip participants with 10′ toboggans and 70% of the toboggans we sell are 10’ers. 12′ Toboggans will pack a load that can see you on the trail for weeks on end. 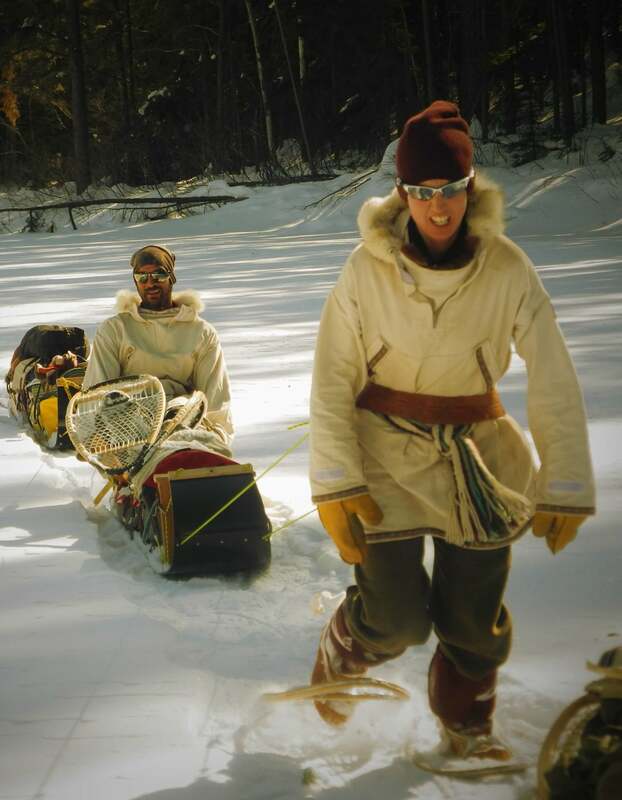 The length and packed weight of these toboggans can make them a brute to deal with on the portage trail. If one of these slips down a side-hill, or falls into a tree-well, you’d better have a partner (or cord and pulleys) handy to help you recover it back onto the packed trail! These are best dealt with by two or more people on difficult portages. We offer two grades of polyethylene: standard High Density (HD-PE) and premium Ultra High Molecular Weight (UHMW-PE). Read below to see how they compare in terms of friction, abrasion resistance and durability. We’re all looking for an easier haul, and UMHW does have a lower coefficient of friction. BUT in reality we haven’t noticed any difference between the two grades when out on trip. Watch the 8 minute video at left to see just how little difference in friction the two plastics have. A few scratches are not going to slow that toboggan down! Again, industrial testing suggests the UH plastic should perform better than HD in terms of abrasion resistance, but in reality we haven’t noticed anything to write home about. If you’re pushing the season early or late, and heading out on portage trails with the rocks poking through, you’ll be leaving little black curls behind, regardless of what plastic you’re hauling. The good news: we have hauled brand new toboggans next to ones that have seen the worst rocks and roots we can throw at them, and haven’t noticed much difference. This is the big one, with major differences in performance. UHMW is more flexible in cold weather, and as a result is nearly impossible to snap. HDPE on the other hand, while also very flexible and durable can start to become more brittle at -20C or lower, and can become susceptible to breakage if stressed too much in the cold. We offer a 3-year plastic warranty on HDPE toboggans and an absurdly long 7-year warranty on UHMW toboggans. See below for details. If you bought a DIY kit: We will send you a new toboggan blank. You will strip the crossbars and all outfitting off of your old toboggan to use on your new blank. A couple of hours of work on your end will have your toboggan as good as new! If you bought a finished toboggan: We will send you a “bare bones toboggan”. That is, it will be a toboggan with all crossbars installed, hood curled and running line installed. You will strip off the lash system, brake line and tump from your old toboggan to use on your new one. An hour or less of work and you’ll be good as new! What we ask in return: That the toboggan be cared for and stored properly in the off-season. Toboggans should be stored flat (you can leave the hood curl in place), in a cool, dry, dark place. A summer of sunlight can do a lot to age your toboggan plastic as well as all the outfitting. Also: we’re not a big corporation with deep pockets. If your buddy ran over your toboggan while backing out of the parking lot, we’re hopeful you’ll ask him to replace it!